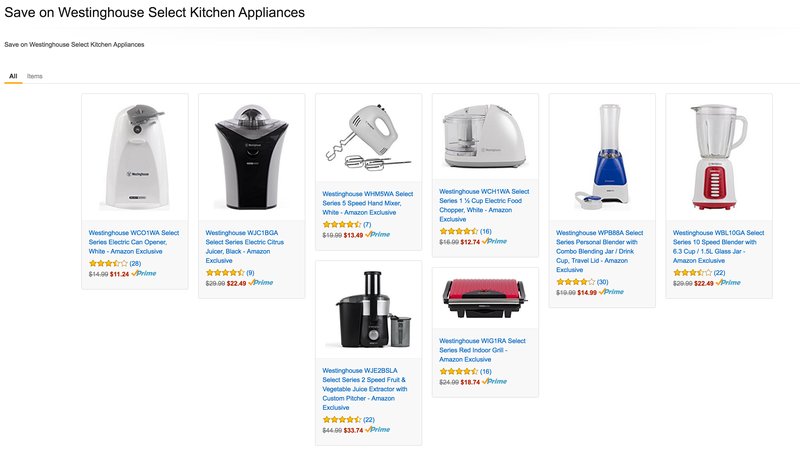 Today only, as part of its Gold Box Deals of the Day, Amazon is offering a number all-time lows on Westinghouse kitchen appliances including juicers, indoor grills, blenders and more from $11 Prime shipped. Everything in the sale ships free for Prime members or in orders over $49. One standout from the bunch is the Westinghouse Select Series 2 Speed Fruit & Vegetable Juice Extractor with Custom Pitcher (WJE2BSLA) for $33.74. That’s about 25% below the original listing, the lowest Amazon has ever offered it for and the best price we can find. Rated 4+ stars from over 20 Amazon customers. Other all-time lows in the sale include the Select Series Electric Citrus Juicer in black for $22.49 (Reg. $30) and the Select Series 5 Speed Hand Mixer for $13.49 (Reg. $19+). Both of which have 4+ star ratings. Experiment with a variety of fresh fruits and vegetables to make excellent juices, soups or sauces. Let your juice extractor show you just how good it is as it creates delicious and healthy drinks from things like apples, grapes, carrots and tomatoes. Just drop your sliced fruit or vegetable into the chute and let the juice extractor take it the rest of the way. It’s just that simple. One of the keys to your juice extractor is the sieve, which has the critical task of separating the juice from the pulp.